FatBikes bring new meaning to the "Beach Ride." In my family, going for a beach ride means riding our bicycles down to Bradford Beach on Milwaukee’s lakefront. On a hot day, the traffic on Lincoln Memorial Drive makes riding a bike the easiest and most efficient way to get there. Arriving all hot and sweaty makes that first jump in the lake even more refreshing. The only down side is the ride home because you end up all hot and sweaty again by the time you get back. My daughter Frankie walking past the bikes locked to the railing at Bradford Beach. The racks at the beach are always full on a hot weekend day, a nice problem to have. Well, Greg Smith, co-owner of Schlick Cycles, and some of his pals have come up with a solution. Instead of riding to the beach, ride your FatBikes on the beach. Then you can jump in and cool off any time you want. FatBikes, like the Schlick Northpaw, are mountain bikes built to accommodate tires as wide as four inches. The frames have special 100mm wide bottom brackets, incredibly wide forks and rear triangles and sometimes off-set geometries so you can swap front and rear wheels. This Molteni orange Northpaw watches the skinny bikes roll past without a hint of envy. The first FatBikes were built in the 1980s by Texan Ray “El Remolino” Molino for riding on sand. Remolino modified bikes to accept super, extra-wide rims that could support monster tires. 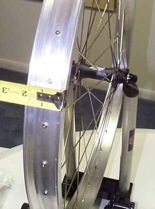 He eventually pushed rims to such widths — three times wider than regular rims — that special bike frames were needed to accommodate them. Then in 1999, Mark Gronewald of Wildfire Designs Bicycles in Palmer, Alaska took the FatBike from the hot sands of Texas to the arctic trails of Alaska. Gronewald tinkered with frame designs and super-wide Snowcat rims. Beginning around 2001 his FatBikes began sweeping the field in the ultimate test of fat-tire bikes, the extreme races across the snowy winter trails of Alaska. The super-wide tires proved themselves superior to regular mountain bikes in both the 350-mile and 1,000-mile Alaska Ultrasport races along the Iditarod Trail. 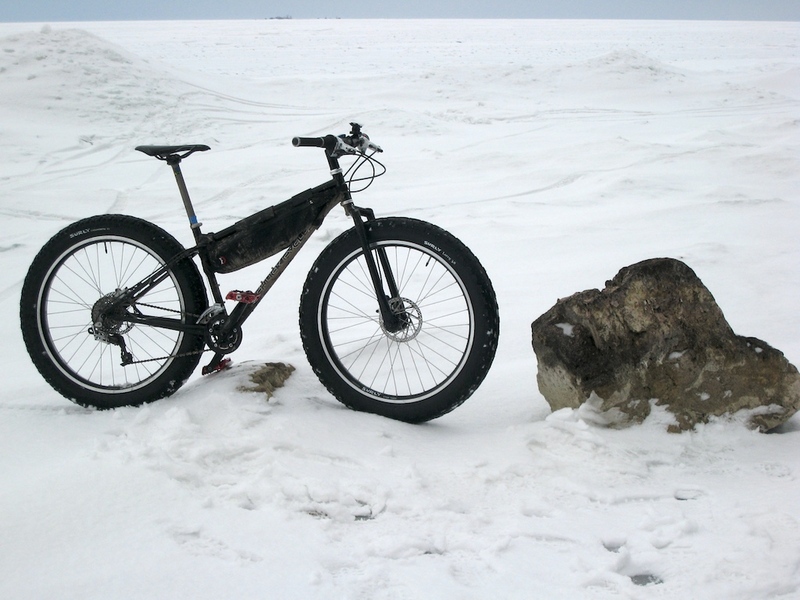 The high-profile victories in those extreme endurance races pushed the FatBike concept from the desolate frozen tundra into the marketing rooms and CAD files of the bicycle industry. 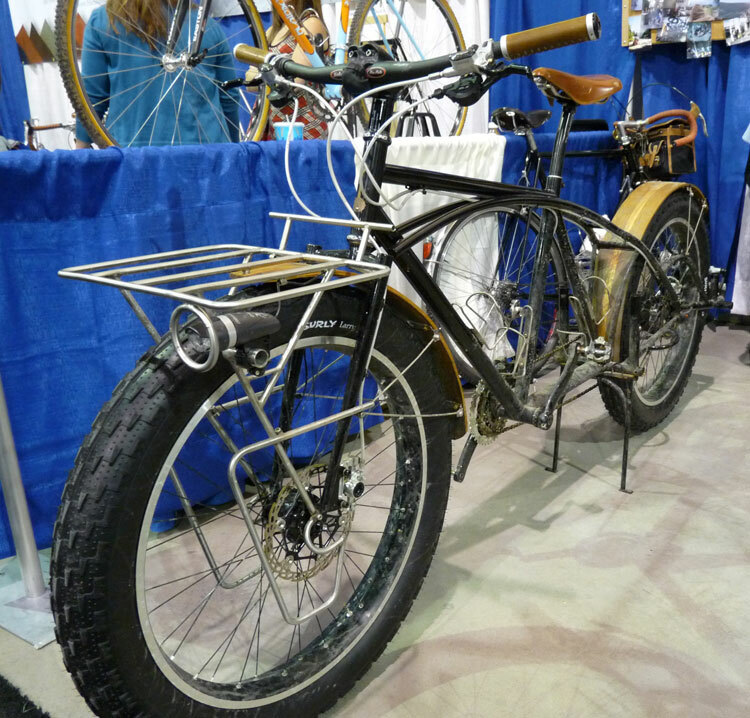 Surly, now a division of Quality Bicycle Products Inc., was the first to mass market the FatBike with their Pugsley. Surly also makes a 2 1/2 inch wide Large Marge rims and 4 inch wide Endomorph tires to fit FatBikes. While Surly’s Pugsley is the market leader, there are now quite a few other companies and many custom builders who make FatBikes. As you would guess, Wisconsin is home to some of the nicest in the genre. One of my personal favorites was the Big Dumb Pug built by Aaron Rogers of Banjo Cycles in Madison, WI. 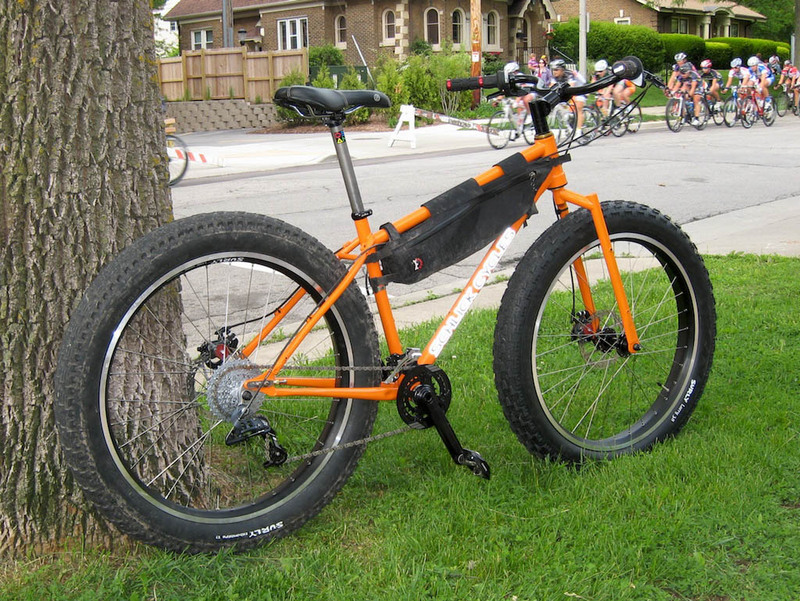 A combination of a FatBike and a Surly Big Dummy, I dream of owning a bike like this for deer season. Photo of Banjo Cycles Big Dumb Pug from the 2010 National Hand-built Bicycle Show. Milwaukee-based Schlick Cycles makes the well thought out Northpaw. The Northpaw built the Northpaw with a 1.5″ head tube so you can adjust the head tube angle depending on riding conditions (using the Cane Creek AngleSet). Another nice feature of the Northpaws is that they are built with offset frames so the bikes can be built up with standard 135mm mtb hubs rather than FatBike specific hubs. 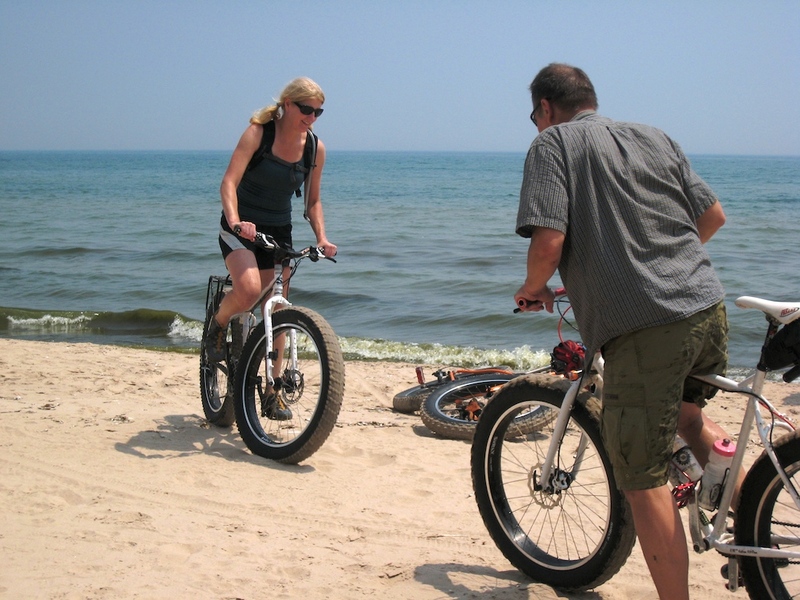 About 20 FatBike riders, including 3 on Wisconsin-made Schlick Northpaws, met at Terry Andre State Park on the shore of Lake Michigan for some beach riding goodness. Beach pre-ride meeting in the parking lot. Starting at the beach parking lot at Terry-Andre State Park, we headed south along the shore near the waterline. A light Southeast wind brought us a cooling breeze that was welcome on a day when temperatures were in the high 80′s. The group rolled out easily and rode 4-5 abreast engaging in conversations and general playful tomfoolery. The group dynamics of a beach ride is one of my favorite aspects of riding a FatBike. In fact, I’ve dubbed FatBikes “The Social Bike” in part for this reason. Because of the width of the beach riders can ride together like almost nowhere else. Sara shows Russell how it's done. The sand was fairly firm and the fat tires were rolling well. One of the fun aspects of beach riding is searching for that perfect combo of sand/water that offers the least rolling resistance. It is not always right at the water’s edge where you’d expect and can vary significantly just a few feet either side of where you are riding. I don’t know if there are as many types of sand as there of snow, another surface where FatBikes excel by the way, but you will find quite a variety. Kate powers her pug through the wet. We continued south covering about 12 miles to Harrington Beach State Park where we enjoyed an adult beverage or two and the cooling waters of Lake Michigan before the turnaround and the return trip. Any time you get hot, pull over and jump in. Now heading north, the headwind became a tailwind and average speeds picked up a bit. The feeling on the beach whipping by at close to 20 miles an hour was great but short-lived as the heat and lack of headwind made it WARM! Ratcheting the speed back down to a comfortable pace we used a couple of brief stops to enjoy the breeze and play around with tire pressure. Because of the volume of air in those huge 4.0-26″ tires a few pounds of pressure change can make a real difference in the way the bike works on soft surfaces. Tony and I ended up using about 8PSI in the front and 9PSI in the rear that offered a lot of flotation and felt almost like floating above the sand. 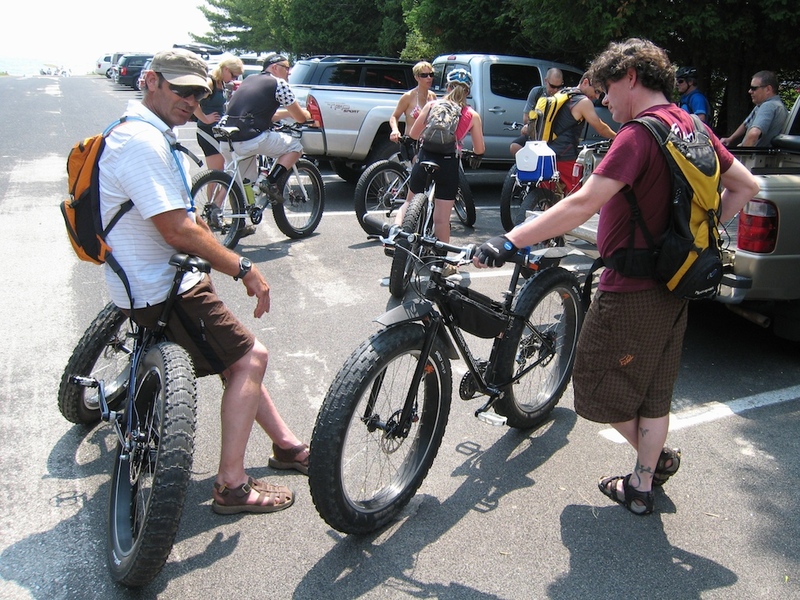 We plan to do another beach ride in August and will announce it on Facebook as well as the schlickcycles.com website. Come join us! Just in case the heat and humidity has you dreaming of cooler days, below is a nice shot of a Northpaw from last winter to help you remember that FatBike cycling fun doesn’t stop when the snow falls. Northpaw FatBike on Green Bay near Fish Creek, WI. Photo from Schlick Cycles Flickr page. Right on, Dave! Great report on FatBikes and thanks for the mention of Schlick Cycles! 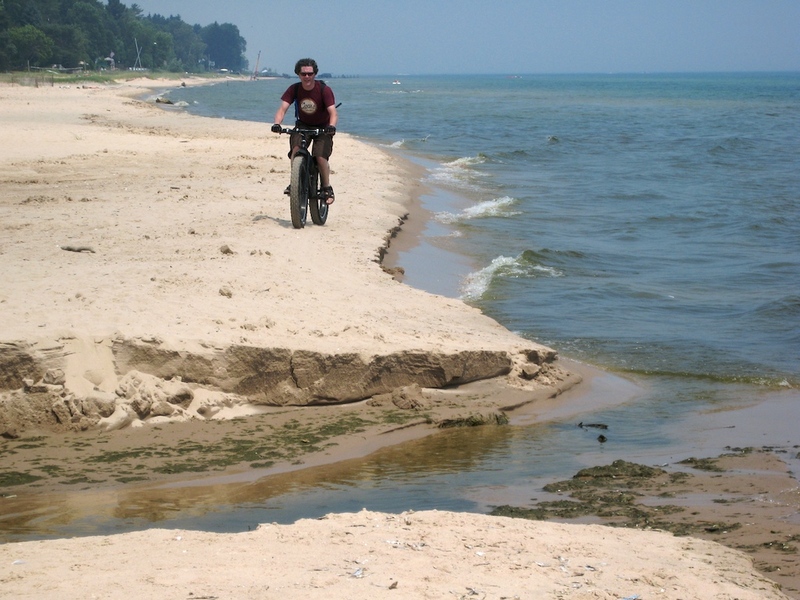 BTW, we are working on another beach ride, this time likely from Harrington Beach to Port Washington and back, sometime in mid-August. We’ll keep you posted. Smiles are the norm while pedaling the Fat tires!!!!! My friend Tony Berger has the first prototype that Schlick made. I rode it a few weeks ago. I laughed the entire time I was on it! He kept the tires at 15 psi – FIFTEEN!! My absolute favorite part was driving full tilt right at a curb and without pullng up on the front at all, you would just blub-blub your way over it like as though it wasn’t even there! Fun on a bike, the first reason we learned to ride as kids and you can forget all green, healthy, economical arguments, fun remains the foremost reason we keep pedaling as adults.